Published 2013 Buy it now! Deira has fallen. Aethelfrith, aided by Cerdic’s half brother, Hussa is triumphant and Cerdic must lead princes Edwin and Hereric over the border into foreign lands. They number a mere fifty men, women and children. They have no land, no crown, little money and no plan. There are determined enemies in pursuit behind and precious few friends in front. 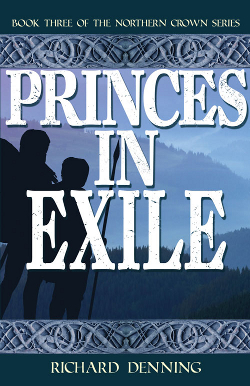 Cerdic must dig deep to find a way to help the Princes in Exile. The flames of our campfire danced higher, the flickering light illuminating the ruined old Roman temple we were sheltering in. Then they died back and as the light retreated the night�s shadows crept once more into the corners of the ancient place. It seemed to me at that moment as if the encroaching darkness mirrored the gloom in our hearts. �Enough!� Edwin barked out and in a sign of his frustration he threw a branch into the fire. Embers, sparks and ash flew skywards. �Enough running!� he continued, �Let us return this very summer and attack Aethelfrith!� In the firelight his eyes glittered with a sudden passion. Around him the twenty warriors of our little band were silent, wary to speak out in front of the young eighteen�year�old Prince, the sole remaining son of the great King Aelle, who had ruled our land, Deira, for fifty years and carved out a nation for our people. Yet Edwin�s older brother, Aethelric, had proved a weak successor to Aelle and had lost Deira to the Bernician King Aethelfrith, just two weeks before. Edwin and Hereric, his nephew, had been forced to flee with a handful of warriors including me, as well as the women folk and children from the village where I, Cerdic, was once thegn. We made a pitiful, vagabond force and were certainly far too weak to face the might of Aethelfrith, who could summon a thousand and more spears to his banner. �We at least should go back and find my cousin, Osric.� Edwin persisted. He had felt this way on the night Deira had fallen and Osric had been captured, but we had persuaded him then of the futility of facing the Bernician King with our tiny force.� I thought he had seen reason at that moment. Since then we had plodded on into Mercia, hiding in hills and forests and avoiding settlements where possible for fear that the inhabitants might report our passage to Hussa, my treacherous half-brother and Aethelfrith�s lieutenant, who we all feared was close behind us on the road and who, when we fled my village, I had fought and almost killed. Yet he had survived and I knew he would not give up the hunt. To say we hated one another does not say it strongly enough, and yet it is complicated. Were it not, I would have killed him years ago when I had the opportunity. Sabert, Earl of the Moors and Wolds, was shaking his head. The oldest member of the company, he had once advised Aethelric and also � for many years � Aelle before him. Earl Sabert sometimes had little patience for young men�s ideas � a fact I knew full well from the time when he and my seventeen�year�old self had argued bitterly. But I was �twenty-three now, a man full-grown with a wife and son of my own. Sabert and I had long since become friends and allies. Indeed, he was the one man present whose wisdom I trusted above all others. �Why are you shaking your head Sabert?� Edwin snapped irritably. He was right on both counts. Asha was Edwin�s sister and Hereric�s aunt, but had married Aethelfrith in the days when our nations were friends. Indeed, it was not that long ago and it had seemed to us all at the time that our brother English lands were coming together. Yet if we were brothers then one brother had betrayed the other. For Aethelfrith had turned on us, killed Aethelric and forced Edwin and Hereric to flee.� Now the two lands were but one nation ruled by Aethelfrith and his Queen. Not long ago Asha had produced a son, Oswald, and Hereric was right � his aunt would do anything to ensure her child sat on the throne of a united Northumbria. As for Eanfrith, he was Aethelfrith�s son, the sole child from his first marriage to Bebba, who had died some years before of the plague. I remembered with sadness that the same plague had also killed my father and almost lost me my wife and son. Thank the gods they had survived. I glanced across to the side of the temple where, snuggled up inside my cloak and now fast asleep, my boy, four-year-old Cuthwine, was lying beside the remains of a stone pillar. Close by the lad, my wife Aidith was warming her hands over another, smaller fire then helping Mildrith, my sister, to hang fish over the flames. She saw me looking and smiled at me. Returning to her work her smile faded and I saw fatigue replace it. She was tired. We all were. Small wonder for we had been running from the pursuit we feared was close behind us for two weeks now and we were all very dirty and exhausted. My beautiful Aidith was the daughter of one of the villagers, yet although her father had been neither thegn nor Earl, she had taken to the role of my wife and become mistress of our little valley with ease, as if authority were her birth right. Alas, when our home, the Villa, had gone up in smoke, her world had turned upside down. She had never really been part of this world of kings and princes that we now inhabited � this other part of my life that had sometimes taken me away from home. Now here she was, fleeing from one king in the company of all that was left of Deira�s royal line and it was obvious she was not taking well to the change in our circumstances. I could not blame her. Seeing her exhaustion I knew we could not run forever, but what could we do? �I agree with Earl Cerdic,� a gruff voice spoke. I glanced at its owner in surprise. This was Guthred, Lord of estates that lay to the south of my own. He had harboured a grudge against me ever since I prevented his son�s marriage to Mildrith in favour of my childhood companion, Cuthbert, whom she loved. I glanced across at her and saw that Cuthbert had now joined her by the pillar and was grinning, holding up a brace of pigeons he had shot. Cuth, as we called him, was the best archer in our company. All his arrows had been lost in the fight against Hussa at the Villa, but he had managed to acquire a dozen more from a village we passed through a couple of days ago and our cook pots had benefitted from his skills these last few nights. I turned back to Guthred, who must have seen me looking at Mildrith and Cuthbert because his face now grew dark as he regarded the cause of his humiliation. I spoke swiftly to distract him. �You agree with me?� I asked in disbelief. �Well yes, but who?� Edwin asked, picking up another branch and this time poking the fire with it. He had a point. Bretwalda � Lord of Britain � was the title was given to the King who held the greatest authority over the English kingdoms. Other kingdoms, though self�ruling, granted the Bretwalda respect and would be swayed to follow his policies. For years it was Kent � the first and oldest Saxon kingdom � and its king who held that power. Yet up till now it had not much concerned we Angles north of the river Humber. We had our own troubles � our own struggles for power to contend with. Now though, we were south of the Humber and Aethelfrith, now the master north of it, was surely a threat to the power of any king in the land, even the Bretwalda. Maybe Guthred was right and we should seek Aethelberht�s aid. �Who then?� Edwin asked, nodding his thanks to Aidith who was handing him a hunk of bread and a piece of fish. She came round and gave me my portion and I hungrily wolfed it down, thankful for it. Food was scarce and we had eaten little for two days. Today we had managed to buy some bread in a village we passed as well as catch a half dozen eels in a river not far from the temple. After only a few mouthfuls of the fish I began to feel a little stronger, but as Aidith turned away I noticed how weak she looked. Had she been starving herself to give me food? I pulled her back and gave her the remains of my portion of bread and she took it without much resistance. I knew then that Sabert was right � we could not go on much longer scavenging an existence in this way. We needed shelter, but where? �You mean King Pybba?� interrupted Lilla. The bard was cleaning mud out of his little bone flute. �I have met Ceorl, he is a decent fellow, but I am less sure of Pybba.� Lilla had fallen over in a stream earlier in the day, as had I, but whilst I was still caked in mud he, as always, looked clean and tidy with only his flute the worse for wear. How did the man manage to always look so good? I supposed it was all part of his act. �Why are you unsure of Pybba?� I asked him. Edwin turned and looked at me, his expression quizzical. �Well, Cerdic. What do you think?� There was an edge of challenge in his voice. Was I being tested? It still took some getting used to, the Prince asking my opinion. It was not long ago that he had dismissed me, insulting me by saying I was nothing more than a farmer, but since then we had fought together side by side at Degsastan and Godnundingham and reached something of an accommodation. Not only that, but I had got him and his nephew away from Deira unscathed. Then again, the princes had precisely three lords left � myself, Sabert and Guthred � to ask for an opinion. Sabert was the more senior, but I realised it was not yet clear in whom these young princes would put their trust. Guthred had been a member of the Witan almost as long as he had been a thegn and had his own opinions, which often conflicted with my own and Sabert�s. Ignoring his tone, I replied, �I would agree with Sabert.� I knew it sounded weak even as I said it. There was a snort of derision from Frithwulf, Guthred�s son � the one who would have married my sister Millie were it not for my cancelling the betrothal my father had arranged before he died. Needless to say, there was no love lost between us. ��Lapdog!� Frithwulf whispered, loud enough for only me and his father to hear. Guthred smiled at the insult. �Sabert�s loyal lapdog,� is what they were calling me. My hand went instinctively to Catraeth, the old Roman short sword I had carried since I took it off the first man I ever killed when defending my village against raiders from Elmet. I had killed a lot more since then! I shook my head and got up from the log I was sitting on. He was not worth the fight and in any event we could not afford bloodshed amongst us. We were so few I could not pick a battle with one of only twenty�five men the princes had at their disposal. �With your permission, Highnesses, I will check the guard,� I muttered and moved away towards the entrance of the temple. Aedann and Eduard were standing there, looking out into the darkness. As I walked across to them Cuthbert joined us. The half-light of the moon illuminated the empty hillside upon which the temple stood, as well as the dense woods all around. �You are going to have to deal with those two before long,� Cuthbert grunted, tilting his head towards the fires. I looked at him sharply and then laughed. My keen�eyed friend did not miss much. �Causing you trouble are they, mate?� Eduard asked. �Want me to sort young Frithwulf out for you?� He offered this in an ominous tone, gripping his axe tightly and tensing his bulging arm muscles. I shook my head and with a sigh, Eduard slid his axe back into his belt. I glanced at Aedann, my other companion. The dark�haired Welshman was watching the edge of the woods and did not seem interested in the discussion. I patted him on the shoulder and walked back across the temple, past the fires to the rear door. This was narrower � probably the priest�s personal entrance. Maybe his own house had once stood nearby. I passed through the doorway. Out here the hillside dropped down into a marsh.� The woods on either side petered out into scrub and bush and then faded away entirely. A stream meandered through the meadow between the woods, which as a result was boggy and marshy, but was penetrated by a faint track running across a patch of dry ground. We had scouted it briefly earlier. It would take us further south and west, so we had decided that was the way we would go in the morning. Leaning on a spear near the rear entrance, the grizzled old veteran Grettir was studying me in silence. I frowned at him. Grettir had been a warrior since before I was born. He had stood back-to-back with my uncle on the battlefield and seen him killed. Later he had trained me and my friends, as well as fighting beside us at Catraeth. I trusted his wisdom in war just as I did that of Sabert in statecraft. I stared at him, knowing he was right. �Then we must decide tonight what to do,� I said, turning back to the fire. I got up and moved hastily to the doorway, Edwin on my heels. �What is it Cuth?� I asked. There was silence as everyone strained his eyes to pick out any detail, but I could see nothing unusual. �Check the south door,� I instructed Aedann. �He nodded and scuttled away, past the main fire to the other side of the temple where the small door led out of the rear of the structure. For a moment he scanned the woods on that side and then turned to shake his head at me. Above us, through the caved�in roof, I could see the moon on its descent towards the horizon. We had not stopped our march today until just after nightfall when we had found the abandoned temple. It was now the middle of the night and there were still a few hours before dawn. I was tired so maybe Cuthbert was too. He had been out hunting for several hours on his own after all. He spun round to face me, his eyes wide. I thought he was angry and about to strike me, but instead he seized me by the shoulder and tugged me over to one side. We fell in a heap at the top of the slope. Above me an arrow sped through the space I had occupied only moments before. Another arrow zipped past my head and I ducked again. �There!� he pointed to a large oak tree. At its base I could now see a smaller shadow, it was an archer loading his bow. �Come on!� I shouted, pulling Cuth up the hill behind me. A moment later there was a shout at the bottom of the hill and glancing back I could make out other shadows joining the first. A dozen now. No � more than that. There could be two dozen maybe. The shadows moved forward and broke into the moonlight and I could make them out now. Around twenty warriors, fully armed and armoured, emerging from the woods and coming up the hill towards us, sword and axe blades glittering silver in their hands. We had reached the doorway. Eduard pulled us back inside even as he was tugging his own axe from his belt and reaching for his shield, from where it was propped against the wall to the side of the door. Then he turned and bellowed out a warning to the rest of the company. �Is it Aethelfrith?� Edwin asked as he peered around the doorway. Another arrow leapt out of the darkness toward us and smashed into the lintel above our heads. �Highness, get inside the temple!� I shouted. Edwin looked reluctant, but I turned to glare at him and he moved away. Grettir, who had come running over from the rear door, thrust my shield at me and then moved past me to block the doorway. With a clatter of wood, Eduard locked shields with him, the two of them standing side by side. Now more men had joined us at the entrance. I glanced towards the rear door and saw that Aedann was dragging others into formation over there, including Frithwulf. Over at the cook fire, Mildrith and Aidith were herding the village children and women folk into whatever shelter they could find amongst the rubble of the temple interior.� Cuthwine tried to scamper past them to join me, his little wooden sword in his hand, but Aidith latched onto his tunic and with a squeak of protest he was tugged back into the relative safety afforded by the pillars. At the main fire, Edwin and Hereric were buckling on swords and finding their helmets. The younger prince started towards the door but Lilla and Sabert were now with him � telling him to stay out of harm�s way. I returned my attention to the front and chanced a glance over Eduard�s shoulder. There was enough light from the moon and our fire to distinguish about thirty men at the base of the hill. They were forming up into a shield wall, spears held in readiness. Behind them, still half hidden by the trees, was a figure on horseback. He shouted out an order and the shield wall began rolling up the hill towards us. An arrow sped downhill towards them, caught one man in the shoulder and he fell back into the bushes. Above me, having found a way up to the ruined roof, Cuthbert gave a shout of triumph and notched another arrow. A couple of sling shots were fired back at him in answer, but Cuthbert was moving into cover behind an intact part of the roof and the missiles ricocheted harmlessly off the stonework. My friend grinned down at me and then moved to pass across above the lintel to another gap in the roof. As he did there was a sudden crack and Cuthbert gave a cry of alarm as the lintel and a chunk of roof teetered sideways. Chips of stone rained down upon us and I moved my hand to cover my head realising I was not wearing my helmet. I held my breath, half expecting the entire structure to come tumbling down upon us. Yet, after a few moments, Cuthbert managed to manoeuvre himself away from the unstable part of the roof and had soon found a more solid section off to my left. �There was a tap on my shoulder. It was Aidith thrusting my helmet at me with an expression on her face a little like my mother used to wear if I went out in the sun without a tunic on when I was just a young lad. �Thank you lass,� I smiled. �Now get you back in cover. Where is Cuthwine?� I asked then relaxed as I saw my little boy holding Millie�s hand over near the fire, his expression both excited and frightened at the same time. What was he now? Going on five years? He was still holding the little wooden sword I had carved for him. I sighed, thinking about how the plots and arguments of kings had dragged my son and indeed my whole family into the fury and horror of war. I wished I could protect him � indeed I wished I could protect them all from this. �Cerdic here they come!� Eduard shouted. Pushing these thoughts far away I turned my attention back to the imminent battle.